Concentration of target miRNA measured by miREIA can be affected by efficiency of RNA isolation. Therefore, it is recommended to normalize the measured concentration of target miRNA to the efficiency of RNA isolation using an exogenous control. Efficiency of RNA isolation can be monitored by adding a defined amount of synthetic non-human miRNA, e.g. cel-miR-39-3p miRNA, to the sample during RNA isolation. The synthetic RNA is processed the same way as the target RNA present in the samples. After RNA isolation, concentration of exogenous cel-miR-39-3p added to the samples is measured by cel-miR-39-3p miREIA in parallel with the concentration of the target miRNA. 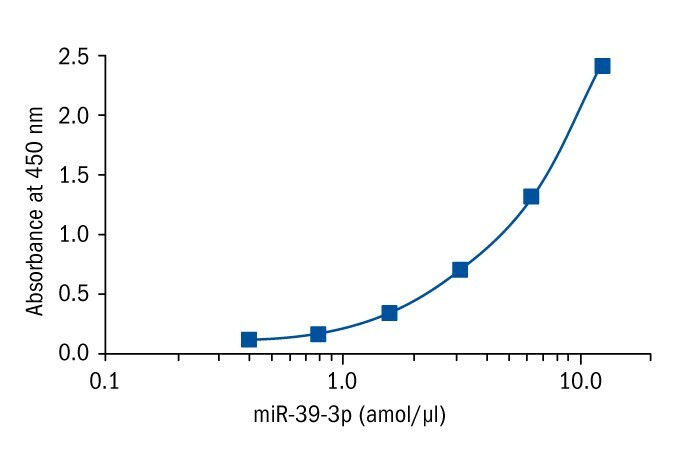 To calculate the coefficient of isolation efficiency, the amount of cel-miR-39-3p added to the samples prior to isolation is divided by the concentration of cel-miR-39-3p measured by miREIA. Finally, the concentration of target miRNA measured by miREIA is multiplied by the coefficient of isolation efficiency for every sample. If such a normalization is applied, then, each RNA isolate sample is measured by two miREIA kits: one kit for determination of the target miRNA (samples are diluted as recommended in the corresponding datasheet) and by a second kit, cel-miR-39-3p miREIA (samples are diluted 10-fold as written in page 15).